Summary: An alloy is more than the sum of its elements with individual characteristics combining to form a unique new metal. 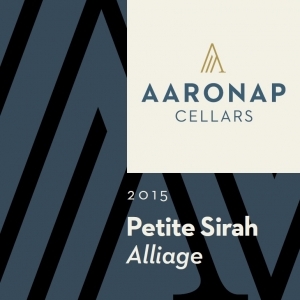 Our flagship wine Alliage similarly combines Petite Sirah, Syrah, Mourvedre, and Cabernet Sauvignon to form a full-bodied wine that is so much more that the some of its parts. Aromatic notes of black cherry, blackberry, vanilla, & earthy cocoa partners with a dense tannin structure and broad mouthfeel that seductively teases your taste buds. A wine made to pair with grilled meats during a summer cookout or an elegant beef roast on a chilly winter’s evening. Aging Protocol: 22 months in a mixture of 2 yr old French oak and American oak barrels. Bottled aged for an additional 6 months. 2015 was another warm year in both California and Washington. Summer heat resulting in an early harvest with the Suisun Valley grapes picked almost 3 weeks earlier than normal. Summer heat also resulting in high sugar (Brix) levels in the grapes, so careful amelioration and acidification was done to bring the grape chemistry into desirable ranges. Vigorous warm fermentations highlighted the dark fruit characters. All varietals were aged separately in barrels and then blended just prior to bottling. This wine is unfined and unfiltered so sediment is likely to form in the bottle during aging.